This story of a parallel magical universe offers a welcome twist on the usual werewolf romance. Eli is still the typical redneck werewolf, but his fated mate is half-elf Arden. This is a fun romantic adventure. Arden and Eli chase a pack of demon-possessed werewolves with the help of their friends. There is a little bit of suspense but this remains light and pretty fluffy with some great comic dialogue. This story combines familiar tropes from both high fantasy and shifter stories. I enjoyed the world building and character development more than the romance in this book. The fated mate storyline doesn’t allow for the romance between Eli and Arden to build and the chemistry between them might be explosive but it lacks subtlety. However, these two do complement each other. Both love the forest and Arden’s gentle magic is balanced by Eli’s brute strength. The characters in this story are a full mix of magical and supernatural beings – we get drydens, wizards, vampires, elves, demon hunters, and werewolves all mixing together with interesting abilities and character quirks. Arden’s relationships with his supernatural friends are fun and Eli’s relationships with the other werewolves are also interesting. I enjoyed the genre twists and I’m hoping for more books in this series. 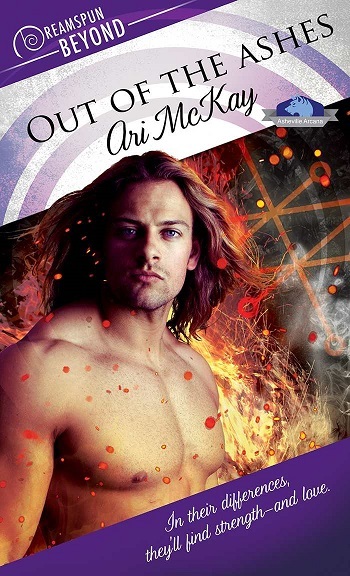 Reviewers on the Wicked Reads Review Team were provided a free copy of Out of the Ashes (Asheville Arcana #1) by Ari McKay to read and review.